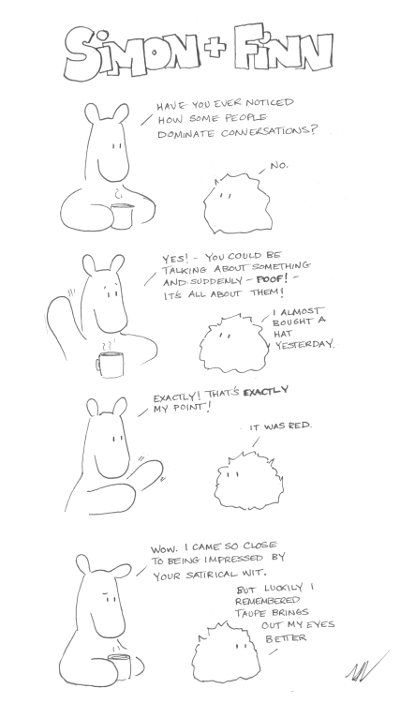 This entry was posted in Fluff & social commentary, S&F Cartoons only and tagged conversation hog, conversation hog joke, conversation weasel, conversational narcissim, philosophy webcomic, simon and finn by simonandfinn. Bookmark the permalink. Funny!!! That reminds me of this girl I know… I think she was wearing a red had too… How ironic. Boy, could she hog up all the attention! I kept trying to tell her about this cute thing my dog would do and she kept interrupting. The dog dog is just sooo cute. It could have a youtube channel. Ah geez, I could go on all day…………..
What was the cute thing your dog was doing? Now I’m curious! I enjoy your recurring theme of voice, more specifically, whose voice gets heard. Conversation Weasel, Why Philosophy? (April 2014), Oilin the Machine (Sept 2012) to name three. We are more connected than ever but our voices remain under continuous assault, both figuratively and literally. And I am enjoying your brilliant comments. Always thought-provoking, insightful, and containing something to share/ teach. Thank you for taking the time to consider and post your take on things, it’s been a great pleasure to read them.